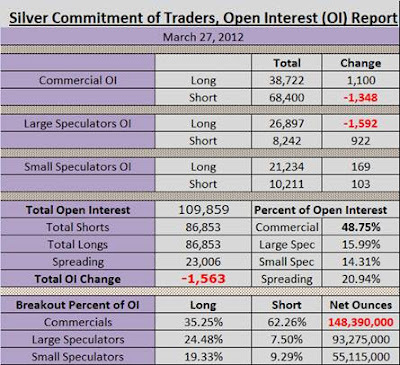 The commercials reduced their silver futures short position a net 2,448 contracts (12.24 million ounces) in the week ending 3/27/12. This is a total reduction of 5,953 contracts or 30 million ounces over the past 2 weeks. (Last week's COT report saw a 17 million ounce reduction in the commercials' net short position). This brings the commercials (i.e. 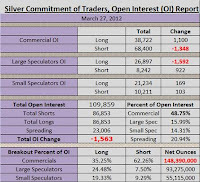 JP Morgan and friends) total net short silver position back down to 29,678 contracts, or 148.39 million ounces. This is almost exactly in between the low near 100 million net shorts reached at the end of 2011, and the 184 million ounces reached in early February. While the cartel obviously still has some firepower remaining and may wish to knock prices lower to cover the remainder of these relatively new shorts, the level is becoming more more neutral than has been seen in recent weeks.